Unlike grocery wholesaling, real estate is low overhead and high profit. Real estate wholesaling in articles and books gets both good and bad coverage. Let's look first at a general definition: Real estate wholesaling is taking a position between a seller and a buyer and profiting from an immediate resale of a property without significant rehab or time of ownership. warehouse space rent and upkeep. office space to manage and sell from. insurance to cover all of the above. necessity to purchase from manufacturers in bulk before sale. can work from their kitchen table. doesn't need to warehouse anything. doesn't need employees nor insurance for them or facilities. can control a large value asset with relatively little money out of pocket. Who is your customer in real estate wholesaling? Before you ever investigate real estate for purchase or control, you need buyers-in-waiting. It's called building a buyer list, and it's crucial to your success. Your primary customers are other investors, either rental property buyers or fix & flip investors. You can sell at retail to consumers, but it's more risky and costly due to marketing and commission costs. their primary interest; are they going to fix & flip or are they buying rental properties? their price range and profit goals; in other words, what will they pay for a home? Do not go out and search for properties or run marketing until you have at least a few active investors on your buyer list. You'll not want to commit to a property without a reasonable prospect of selling it quickly. What are your sources for properties for real estate wholesaling? owner occupied by distressed sellers. relationships with real estate agents and mortgage brokers. the discount to value the buyer will want. the rent that can be charged if your buyer is a rental property investor. the costs of rehab if your buyer is a fix & flip investor. your costs in getting it to the closing table. Assignment Contract - You sign a deal with the seller that allows you to "assign" your purchase rights and responsibilities over to another (your buyer ultimately). You'll need some earnest money, but you'll need no further financing with this method. You go to your buyer and do an assignment of your rights for a price that includes your profit. Your buyer takes over and takes it to closing. You Contract to Buy - You actually sign a deal to buy the property. This will require two closes, one for your purchase and another right after for your buyer to purchase from you. You'll need earnest money, and you'll need transaction funding to pay for the home and collect their fee and reimbursement from the second closing. 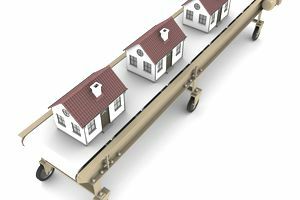 This is admittedly an overview of the process, but it should help those interested in real estate wholesaling to take advantage of the other links and to learn more.